Pretty good tube-like OD. Used 2N5457s and set bias voltages to ~4,5 and ~3,9. Q2 wouldn't work with any other voltage, so i had to tune it in by ear. If you're feeling like there's too little bass response: High pass filter at input starts cutting at 72hZ, so 2n2 might be good alternative as input cap. 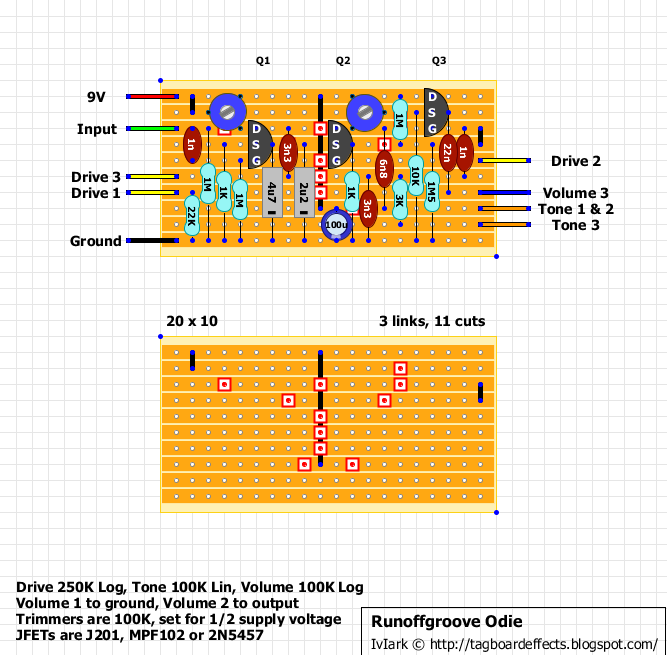 There is some level changes with drive pot, so one could say the volume and drive pots are somewhat interactive. Anyway.. 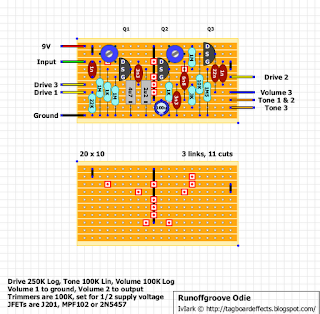 Pretty good tube-like JFET drive. In my opinion, it is as much alternative to TS as banana is for an apple. :) ROG know their stuff. Thanks Mark for yet another painless layout! man, i'd really like to try this, but i've build TWO and neither are working!! :O The first biased, but no signal when switched...probably some mistake, but before I got this working created a second and light wouldn't even change when switched on! Not sure wheat is up, but this is obviously verified. I'll check and see what's up. Maybe i shouldn't have boxed this.. It's ok, but not the greatest ROG circuit. With 100k trimmers it's nearly impossible to get the drain voltages to work.. But when they are set, it's good. Not amazing, but good.